Now performing out of Manchester, Ian Wallace came to stand-up comedy in 2010 and quickly became a fixture of stages in Western Canada. 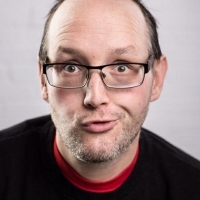 Nerdy, ironic and pop-culure obsessed, Ian delivers comedy that is smart and punchline-driven, with up-to-the-moment flavour and classic structure that make him a hit with audiences of all ages. Ian tours regularly throughout Canada performing in clubs and theatres, his path slowly tracing the image of a swordfish dressed as a ballerina.